This curly birch wood graining, a specialist decoration paint effect, was also used on the vanity units, mirror frames and sink units of this large bathroom. The wood type was chosen to compliment other stylistic elements used throughout. 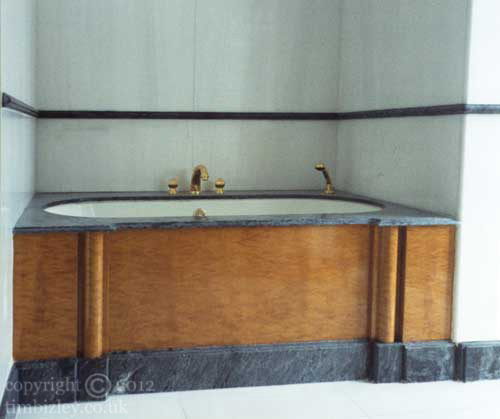 The colour adds a sense of warmth to the area, clad as it was completely in white marble with black marble detailing. Curly Birch is a highly decorative wood and probably underrated in the U.K. Its use has been more common in Continental Europe, especially Germany and Scandinavia.